6/3/2017 – Softened the wording a little in the socioeconomic section. It was intended as comic hyperbole, but didn’t come across that way. English second edition (maybe? My copy has ‘made in the USA’ on the cover, but I can’t actually see that version on BGG). 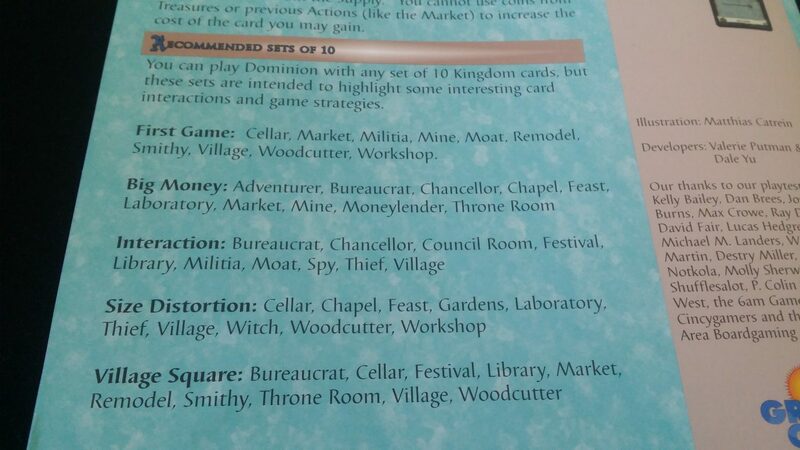 Note that versioning of board-game versions is at best an informal art – this teardown, despite being for the version noted above (or a version very, very like it) is actually for the first edition of Dominion – this was the one that was the current version at the time of writing. The Second Edition of Dominion, released in 2016, is treated as its own entry on Boardgame Geek. So this is the English second edition of the original version of Dominion, rather than the first edition of the second edition. Confusing, I know but that’s what happens when an industry doesn’t adopt a formal versioning system from the start. The comments to this article discuss the second edition somewhat, but I haven’t yet obtained a copy of it myself. When I do, when time permits, I’ll add addenda to each section. 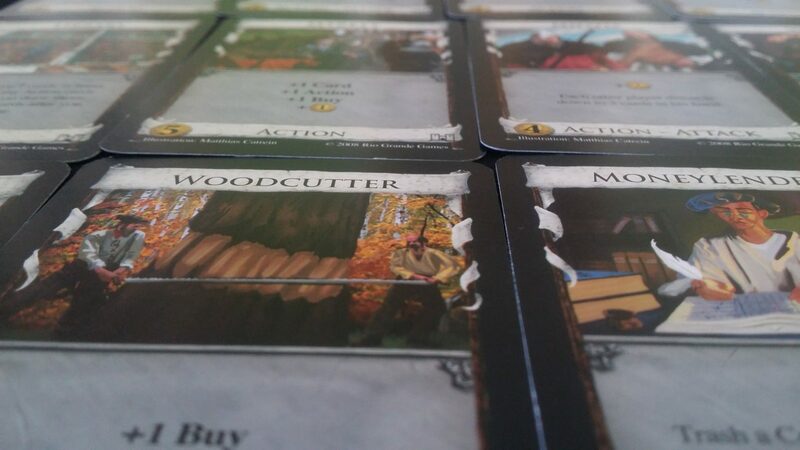 Dominion is the grand-daddy of all deck-builders – a veritable colossus of tabletop gaming. It has spawned an entire sub-genre of games, some of which we have already looked at on Meeple Like Us. Many of those games are just ‘Like Dominion, with…’ and their accessibility issues will be similar. Dominion very much deserves its own coverage though, especially given the four star review we gave it. Is accessibility one of the provinces of Dominion? Let’s go to town on these impressively large decks. Colour blindness isn’t a problem in Dominion. I always like when I get to say that! There’s nothing in the game that uses colour alone as the channel of information. 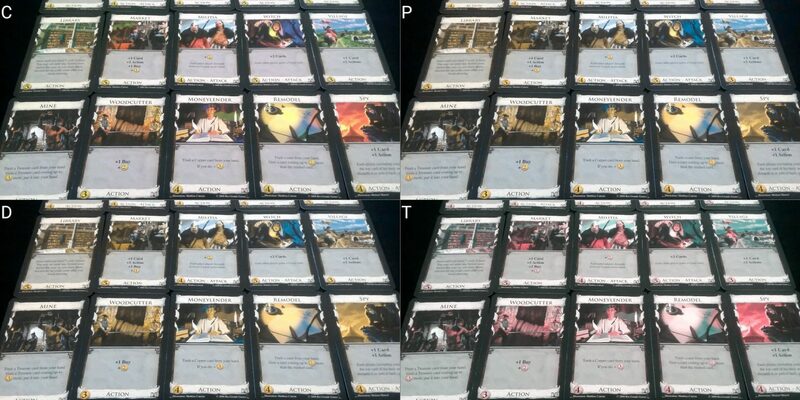 All the different kind of cards have their category printed along the bottom, and what colour coding is present is still recognisable as being different from other cards with all categories of colour blindness. It really is all okay! So, a very strong recommendation here for Dominion. It’s a pretty background, but it gets in the way. The supply of cards available for purchase during a game remains constant – you’ll always have the same options until one or more of the decks are depleted. As such, once you’re comfortable with the offerings available you won’t need to worry too much about the availability of cards changing radically. 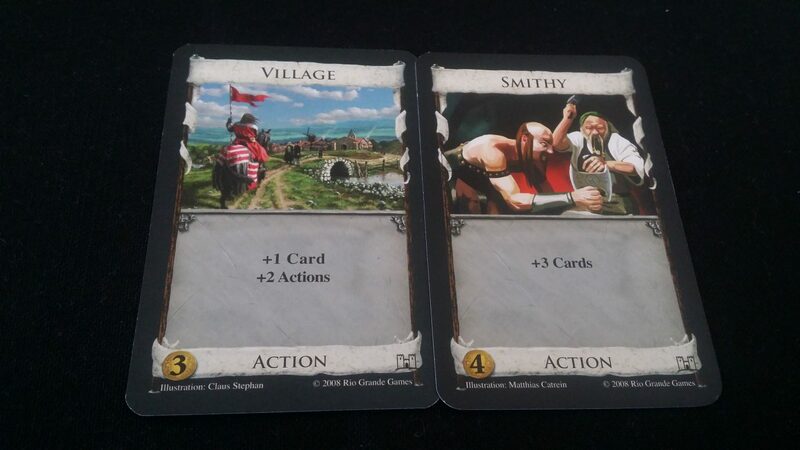 That differentiates Dominion from Star Realms, which has a much greater degree of churn in its economy. It might be necessary to inquire from time to time as to how many cards of a particular type are left, but that’s a victory condition trigger so asking doesn’t necessarily leak game state. You deal with a hand of five cards at a time, unless moderated by actions, and these are played face up in front of you. Mostly, the actions that are permitted are outlined in simple formal language. When the cards have been played down, you can limit the impact of visual clutter by rotating, discarding or inclining cards to indicate those that have been used in the current turn. This is going to be important as you keep track of which have been used now and which are still to impact on further draws. Currency is all handled via cards, and each of the coins you get is of the exact same visual design save for the number in the middle. The number though is printed at a very generous size, meaning that it’s easy to tell, perhaps with an assistive aid, what you may have in front of you. For each of the cards in the supply, the cost is presented in the bottom left corner. This may not be especially easy to see, but the typical layout of cards in the offer will emphasise rising costs so as to alleviate the need to scan the prices. You can have one row being the threes, another the fours, and so on. With this kind of system, you can assume that the top (or bottom, depending on your preference) cards have the highest cost. They’ll be the smoking hot cards, the ones that they’ll need to sell you in a plain brown paper bag. The opposite ones will be the cheap ones – the ones you don’t really want to buy but do so anyway because indiscriminate consumerism is the closest thing you have to personal happiness. The price range is not very large – cards range from two to five in terms of cost, and so it will almost certainly be possible to come up with a layout that reinforces financial implication. 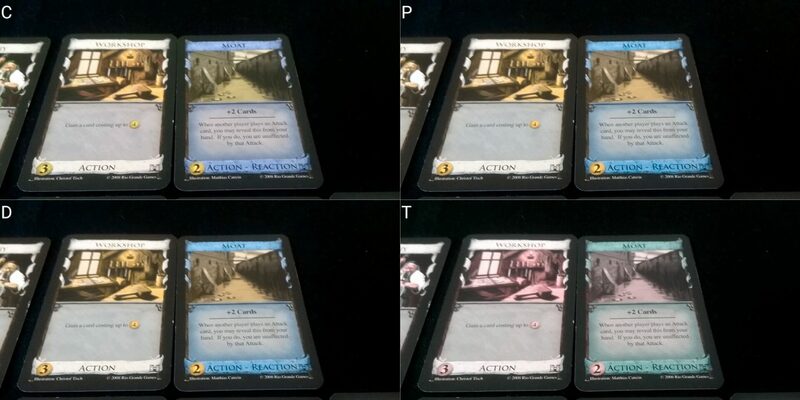 Cards are synergistic, but not in the same way that caused visual difficulties for Star Realms. The synergy is at a much simpler level, such as ‘+2 cards, +1 action’ which allows you to draw two cards and then play another action. As such, while you will need to work out the implications of your draw based on synergy, it won’t require a lot of visual investigation to work out. You won’t need to compare factions, or trigger effects based on what may be out in play. We’ll offer Dominion a recommendation in this category, with the usual proviso that it won’t be accessible for those with the more serious categories of visual impairment. Dominion not as troublesome in this category as Star Realms, but it’s still not something we can at all recommend. The card synergy is simpler, but still involves an ability to work through the ramification of card interplay and decide on the ordering of actions. The way in which you play cards is significant – if you play them in the wrong order, you may find that you have accomplished literally nothing. Playing them in the right order may result in cards cascading everywhere like someone left a weird magical tap running. Turns are heavily contextual, based on the cards you have in your hand. Turn order is consistent, turn flow is irregular. You might play one action and do one buy. You might play five actions and five buys. It’s all going to depend on your deck, the cards you play and the order in which you play them. Knowing the cards that are best to purchase is a function of memory – you need to know what your deck requires, and how best to prune it. To do that, you need to hold a rough representation of its composition in your mind at all times. You can look through your discard deck whenever you like, but the deck in active use must remain unknown. Similarly, knowing what your opponents have been purchasing is important to deciding on your own strategy… SOMETIMES. See, if you have a witch in the supply you’ll probably want to buy a moat since they prevent attacks. Or they can be played as a normal action that gives you another two cards in your hand. Except, you will only want to buy them if your opponent has been buying witches, because otherwise they’re dramatically outclassed by almost any other card you can buy. But if you’re playing a game where there are moats and few other opportunities to increase your hand limit you’re probably going to want to consider them. So maybe? Working this out is expensive for both categories of cognitive accessibility, and the extent to which it makes sense to buy cards will vary as time goes by within any given game. For other games, you can just ignore your opponent until they start buying up victory points, and even then you can probably potter along quite happily until the first province is purchased. The cognitive complexity of any given game will vary according to the cards on offer. I suspect you could probably create a variant with minimal cognitive cost, but it’s unlikely to offer many opportunities to get the best out of Dominion’s robust rule-set. 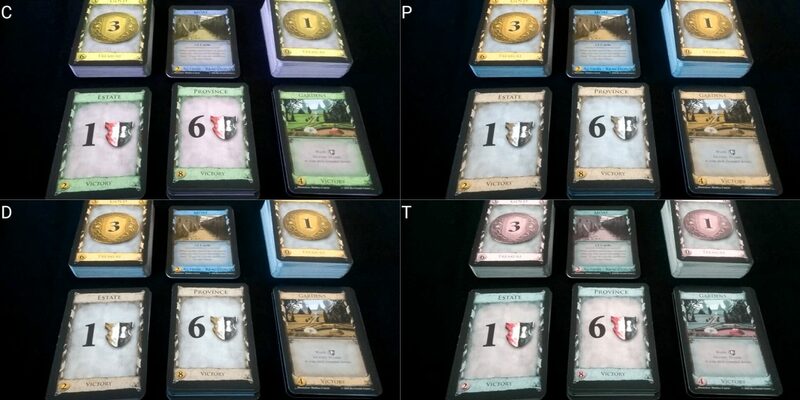 This is one of Dominion’s interesting accessibility nuances – it is not just the turns that have varying cognitive complexity, but individual game configurations will have an influence as they alter the fundamental landscape of cost and benefit. Dominion also has an attached requirement for numeracy, because many of the cards have arithmetic implications. Buying items requires the ability to do simple sums, and may require those sums to be spread over multiple purchases. It also has a (low) required degree of literacy, although the effects of most cards do not require complex understanding of the text on them. Dominion makes use of a simple formal English structure, such as ‘+1 buy’ or ‘+2 copper’, except for those cards that have a more individualized effect. With all of this in mind, we can’t recommend Dominion in either the fluid intelligence or memory categories. Luck plays a major part in success or failure, but not as much as it does in Star Realms. In Star Realms, you need conjunctions of factions to occur for maximum gameplay impact. In Dominion, while you may be reliant on cards with interesting actions you’re rarely dependent on them coming out in matched sets. As such, while Dominion adopts fundamentally the same mechanic of control through curation, it allows it to be done more consistently and with more reliable outcomes. Fortune is less ‘spikey’. 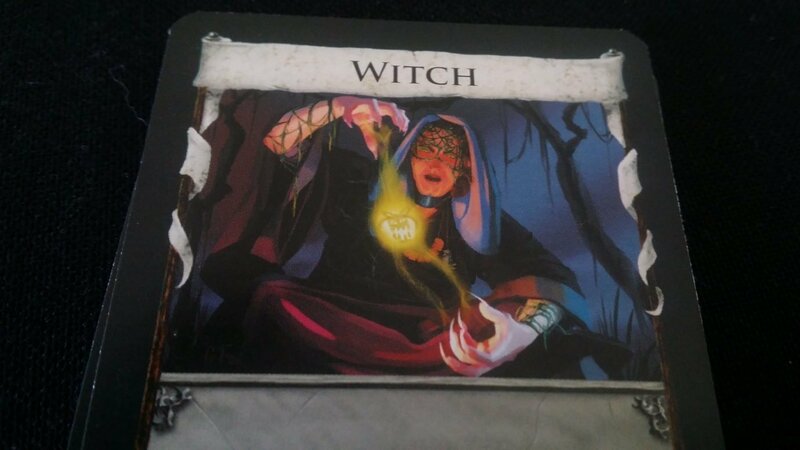 There are still though many times when bad card draws will create frustrations, especially when it comes down to the curses placed in a deck by witches. Estates, duchies and provinces are self-inflicted wounds – it’s hard to be too put out by their constant resurfacing. Curses though come in from an external party. There isn’t a lot of direct player competition in Dominion, but there are a number of cards with explicit take-that mechanics. We’ve discussed the spy and the witch already, but there’s also the thief – he allows you to directly take treasure cards from your opponents. The militia too allow you to force an opponent to discard down to a hand limit of three. Moats permit a defence against this, but only if you have them in hand at the time, and only if moats are part of the game. If you’re using a randomiser to select starting game state, it’s entirely possible that there will be no way to defend against an attack. However, none of the attack cards are explicitly targeted – they affect everyone in the same way. That means there’s no ability to gang up on any one player. Everyone suffers at the same time, and has the same degree of ability to stop it happening. Score disparities can be significant, but they’re almost always down to someone not picking up on the fact other people were buying up victory points. It’s a lesson you only really need to learn once. The presence of curses in someone’s deck can be annoying, but not in terms of score – mostly in terms of the way they sap important momentum from play. The victory point penalty is insignificant in the greater scheme of things. Perhaps the most frustrating element of the game is that on occasion it may become impossible to undo mistakes that you have made. In games where a chapel can be purchased you can consistently prune bad cards from your deck. In a game setup where no trash ability is present, every time you buy a card you’re reducing the probability that other cards will be drawn. Generally speaking, you’ll have more bad cards than good cards because bad cards are far more affordable. This can make certain games frustrating, but most of the recommended decks are unlikely to leave players with no meaningful options for curation in one form or another. We’re prepared then to offer a tentative recommendation for Dominion in this category. The cards in Dominion are of approximate poker card size, and of a decent stock. As is often the case in deck-builders, you’ll be shuffling these almost constantly. Every time you run out of cards to draw, you shuffle and create a new draw-deck. The regular need for shuffling is exacerbated by the limited number of cards you’ll be working with, at least to begin with. It’s difficult to do any kind of effective shuffle with only ten cards, leaving you with either an overhand shuffle or the space-greedy wash shuffle. That issue will go away with time as more cards are accumulated, roughly at the same time your deck size means you don’t need to shuffle so often anyway. Since Dominion is a card game, you’re free to go with a layout that will work for maximum comfort. There will be approximately seventeen card piles in the supply at any one time. That’s a lot, but not so many that you can’t have them all in relatively easy reach of two players at once. You can place them in a manner that is going to work for you. If the shuffling and reaching over to buy cards is likely to be a problem, the game lends itself well to verbalisation. You just play the cards you have in front of you, in an order you can unambiguously enunciate. Each card has its own unique name, and their effects require no complex assessment of intention on the behalf of someone making moves on your behalf. We recommend Dominion in this category. In the review I made mention of how half-hearted Dominion’s theme is. And that’s absolutely true. The theme has no meaningful impact on the game play at all. Many of the cards have little logical connection between what they do and what they purport to be. The lumberjack gives you an extra buy action. Why? That makes zero sense. The chapel allows you to trash four cards. Why? Is it supposed to represent a tithe? 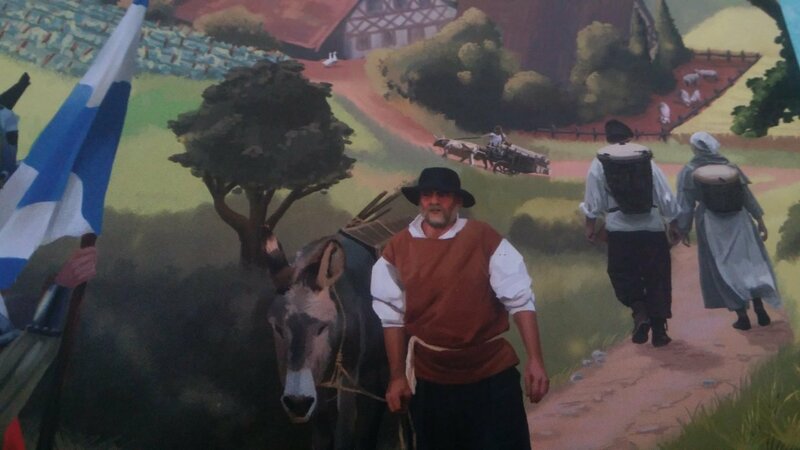 There are more thematic ways to do that even within this subdued remit. A man and his wife. So women are either background characters or horrible witches. As usual, I doubt it’s intentional misogyny, but intentionality doesn’t really matter. Memoir ’44 has no women at all in it, and that’s something I think is fine. Memoir ’44 would need to be a dramatically different game if it was based on a different historical context. Dominion though has no reason why it couldn’t have plenty of women throughout even if they wanted to keep this half-hearted theme intact. There’s a throne room – of the kind Queen Elizabeth was known to frequent. There’s a thief, but no reason why he couldn’t be a lady thief. Why not women in the market? A soothsayer instead of a witch? A woman spy? Everything just defaults to men, including the language in the manual. Not just men though, white men. Remember, Dominion doesn’t have a theme that is implemented well enough to excuse it this lack of diversity. And then there’s the cost. Dominion can play up to four people at a time, and has an RRP of £34. That’s £8.50 per player, which is a considerable sum of money. And if you buy Dominion at that price, you’re only buying the base set. 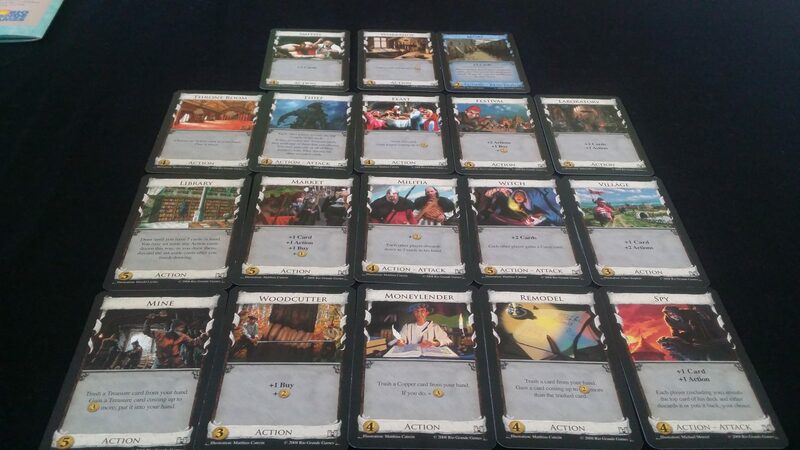 There are ten dominion expansions, each costing anything from £20 to £40. True, you don’t need any of them to enjoy the game but the consensus amongst those that especially enjoy Dominion is that you’ll want at least a few of them to paper over some of the cracks in gameplay. You can buy a Dominion Big Box which contains the base game plus the Alchemy and Prosperity expansions, but that RRPs at £80. This is an expensive game to get into. I’m not enough of a fan of deck-builders to have felt the need to shell out on expansions, but over on What’s Eric Playing he rates the base game at 7.5/10, rising to a 9/10 with expansions. So – bear it in mind. And all of this cost is with a ceiling of four players. If you want five to six, you’ll need to get the Dominion: Intrigue expansion to supply the right number of treasure and province cards. To be fair, the downtime involved in play is probably such that you wouldn’t want to play it with more than four people at a time. The player limit does mean though if you want something interesting for a family games night that scales up to parents, kids and another relative it probably won’t be this. So, we don’t recommend Dominion in this category. There is a literacy level required to play without support, but it’s not high and most of what would be involved in this is easily memorised. Other than that, there’s no specific need for communication in the game. They don’t call it ‘multiplayer solitaire’ for nothing. Dominion is strongly recommended in this category. If there is an intersection of visual and physical impairment, there may be some difficulties in optimising card layout. The traditional system is to arrange each stack in ascending (or descending) cost to aid in visual scanning. If physical impairment is to be considered, the cards should be positioned in a way that is maximally comfortable to access. These may be fundamentally incompatible requirements, meaning that additional support from other players is likely to become necessary. There are no dice-rolls or hidden hands – everything is played out in front of everyone else as you draw from the deck. There are no constraints on turn time, and while you will increase the size of your deck almost every turn you’ll never be directly manipulating it except when it needs shuffling. 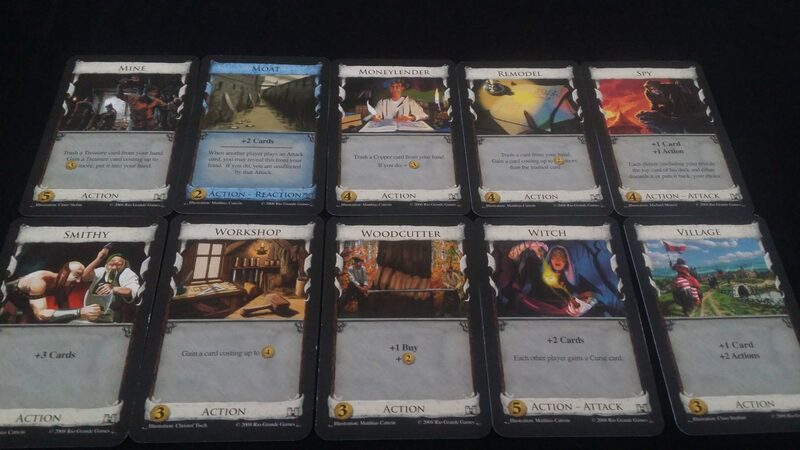 Dominion is a game where downtime can be punishingly dull – there is nothing you can do while you’re waiting for your go to come around again, and usually you’re not even very interested in what your opponents are doing. It only rarely has any direct impact on what’s going to happen on your turn. As such, this can be a triggering issue for certain categories of emotional disorder, and can make it very difficult to sustain concentration for those that have an intersection between emotional and cognitive accessibility requirements. The Dominion box estimates 30 minutes per game. I think that is… optimistic, certainly when playing with those that haven’t fully internalised the rules. I would put it closer to forty-five minutes on average, which is on the verge of being a problem in terms of modulating discomfort. The downtime, given as how other players are rarely doing anything of interest to you, means that it’s often possible to quickly dip in and out of the game for a few minutes here and there. It’s especially feasible in games of four players. That may not be sufficient though. Provided there is more than one player, you can house-rule a reasonably effective redistribution of wealth and cards in the event someone wants to sit out the rest of the game. That won’t work though if it’s being played as a duel. Deck-builders are systems of building synergy – it’s not a surprise to see that Dominion scores so low in terms of cognitive accessibility. Its problems in terms of sociological inclusiveness are less easy to forgive. The meaningful relationship between card name and card effect is so weak that there is no justification for not making an attempt to broaden the representation to include men and women of a variety of different backgrounds. Normally this wouldn’t be enough to push a game into the ‘not recommended’ category, but there is also a very significant financial outlay that comes with buying the expansions that would open up larger player counts and a more satisfying and interesting long-term experience. I bang on about this a lot because I think it’s important. If board-gaming is to be welcoming to everyone, new players need to be able to look at the boxes on the shelves and think ‘Oh, I can see people like me playing’. I don’t mean tokenism. I don’t mean self-congratulatory ‘aren’t we open minded’ celebratory diversity art – I’m not looking for a Beneton advert here. What I’m looking for is for the game art I see to be reflective of the rich diversity of the people we want to play. I’m willing to be forgiving when the theme demands exclusion. Dominion doesn’t have that excuse. Okay, technically this is an advert. And one I’m not being paid for. But it’s being used in a sarcastic way. So… I think the moral high ground is still mine? Sometimes it’s hard to tell from up here on my high horse. But let us not end on a sour note. We gave Dominion a hearty four stars in our review. I may be burned out on deck-builders, but I still recognize that Dominion is exquisitely designed. It’s oozing cleverness, and if you have the deep pockets required to invest in the many expansion packs, you’ll find yourself with a game that will grow and evolve in line with your own appreciation of its splendid intricacies.